The kingdom of Seftrel sits entirely on a low shelf of the Efre mountain range, steep peaks that otherwise divide continent of Li into a western third and the rest to the east. Low enough to grow crops and raise livestock, the terrain into the kingdom lands is steep. Inside are lush valleys trapping water in pristine lakes that leak out into subterranean rivers before emerging in the surrounding lands. Unfortunately we are having to trudge through the heavy snow that this elevation brings, that will feed those lakes, to get to the fort Captain Hundle is taking me to. Even though I’m used to it and just as capable in bad weather, I prefer light leather camouflage armor to this heavy fur lined white I’m wearing now. Captain Hundle and his men hate if for other reasons, but the last time any of them made a comment about it they tasted their own blood for a week. Seftrel does take advantage of the terrain, though. The fort rising before me is built into the side of one of the many hills and mountain tops that make the kingdom formidable. A low wooden building at the bottom of the hill is for stables and basic offices, while natural and man-made tunnels weave back and forth in the face above it. Walkways, both wooden paths attached to the front of the rock and tunnels at the back of each cave entrance, link the five levels of defense, sleeping quarters and storage. Pulleys and ropes allow the walkways on the outside to be pulled up as protection for the cave entrances in case of attack. “I just arrived, Ofeldar. When word made it back to Seftrelak that the credarils are stealing human children, I was dispatched here. I take it this means you’re joining us?” asked Zif from behind a large wooden table surrounded by chairs. His green eyes tempted me to say no. “I have better relations with the neftir than even your father and his ambassadors, and credarils coming to the surface like this is unusual. I had to help,” I said. “Good. Commander Tendelbro is on his way here with a contingent,” said Zif. “He’s the top neftir commander. They are taking this very seriously,” I responded. “Yes, Your Majesty,” said Captain Hundle, the slightest hint of displeasure in his voice. “She may be able to whip all of you in a fight, but Ofeldar is still a woman and we will respect that difference, Captain. Show her to your room, I already had soldiers tidy it up for her,” said the Prince. I barely had time to put my backpack down, heat up water on the wood stove in my room and bathe before the neftir arrived. Quickly climbing into my white fur lined tunic and trousers, I stomped into my leather boots before heading down the four levels of tunnels to the office. “Yes,” all the gathered officers said at once, followed by a round of laughter. “Yes, you’re probably right, Reichet, but that’s why she’s my favorite human. Heck, I like her better than most neftir too,” finished Tendelbro, breaking into a deep rumbling laugh again. “But you are only a Captain yourself, Your Majesty,” I responded. “By my choice, Ofeldar. But as Prince I also have the ability to grant ranks. If you had joined the army as soon as you got old enough, you’d be General by now anyways, I’m sure. I need all the men to respond to your commands. You will lead this mission,” said Zif. “Thank you, Your Majesty,” I said. “Good, now, Commander Tendelbro, please bring us up to speed on what you see underground,” said the Prince. “The credarils have been a little too obvious in not drawing our attention. They usually give us constant trouble on the edges of our villages and mines, making sure we know not to encroach further. But they’ve been noticeably quiet over the last couple of months,” said Tendelbro. “They are redirecting their forces elsewhere, apparently to the surface,” I said. “It can only mean they are looking for more ways to grow their numbers. They think something big is coming,” said Zif. To be continued. 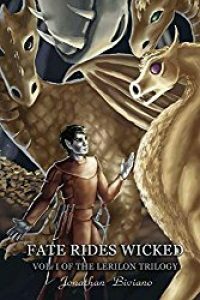 Read more about Ofeldar and the big things that happened in Fate Rides Wicked: Vol I of the Lerilon Trilogy.